Written in Greek by the only Roman emperor who was also a philosopher, without any intention of publication, Marcus Aurelius's Meditations offers a remarkable series of challenging spiritual reflections and exercises developed as the emperor struggled to understand himself and make sense of the universe. Ranging from doubt and despair to conviction and exaltation, they cover such diverse topics as the nature of moral virtue, human rationality, divine providence, and Marcus's own emotions. 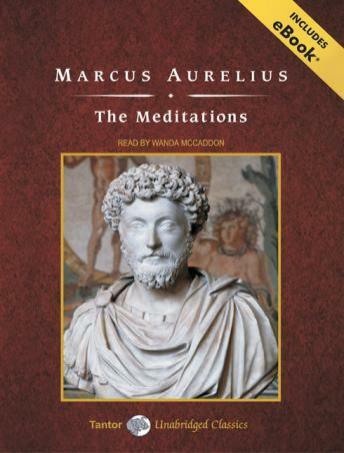 But while The Meditations was composed to provide personal consolation and encouragement, in developing his beliefs Marcus Aurelius also created one of the greatest of all works of philosophy: a timeless collection of extended meditations and short aphorisms that has been consulted and admired by statesmen, thinkers, and readers throughout the centuries. Prepare thine self for a dry narration that puts thy eyelids through much heaviness. The more modern translations of this book are definitely more preferable unless you want to nitpick and really get into something as close to the original material as possible. I can't recommend this as it is by far not the most modern and easily accessible version of an incredible work.